Richard Pollett will long be remembered as a young violinist and musician of extraordinary depth. This together with his unique personality of intelligence, warmth and humility will remain for ever. Richard's life was tragically cut short at the age of 25 but the legacy of his many solo performances with orchestras and in particular the memory of his winning performance of the Symphony Australia's 2010 Young Performers Awards will remain for ever. Richard touched many through his playing and his person and was an inspiration to all who knew and heard him. Born in Adelaide, Richard Pollett began violin studies with Michele Walsh at the Queensland Conservatorium of Music Griffith University in Brisbane, gaining a Bachelor of Music with First Class Honours and receiving the University Medal. He was awarded an Australian Postgraduate Award to do a Master of Philosophy at the University of Queensland and a Llewellyn Memorial Fund major award for postgraduate studies with Massimo Quarta at the Conservatorio della Svizzera Italiana, where he graduated with highest honours. Richard then returned to study at the Australian National Academy of Music in Melbourne with Paul Wright. Richard was successful in numerous competitions. A finalist in the ABC Symphony Australia Young Performer Awards in 2006 and 2007, he went on to win the Strings Final in 2010. Richard was a prize-winner in the Kendall National Violin Competition and the North Queensland Concerto and Vocal Competition in 2004. He was a finalist in the National Youth Concerto competition in 2002, performing with the Queensland Youth Orchestra, and in the same year was a winner in The Queensland Orchestra Young Instrumentalist Competition. As a soloist Richard appeared with the Queensland Symphony Orchestra, the Tasmanian Symphony Orchestra, the Adelaide Symphony Orchestra and the Melbourne Symphony Orchestra as well as the Orchestra of Lugano in Switzerland. He participated in several music festivals in Europe including Kronberg and Lenk Academies, and the Charleston Manor Festival in the UK with cellist Robert Cohen. 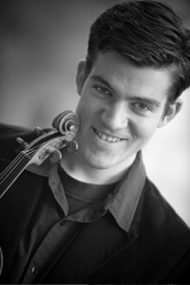 Richard was studying in Israel in 2011 with Ilya Konovalov at The Buchmann-Mehta School of Music. He completed a tour of South America with their orchestra under Zubin Mehta and with Mischa Maisky which was a great thrill for him. Richard toured Europe with the Australian Youth Orchestra and participated in the AYO Young Australian Concert Artists program.